One dimensional smoothly broken power law model. Model amplitude at the break point. Power law index for x << x_break. Power law index for x >> x_break. At values \(x \lesssim x_1\) and \(x \gtrsim x_2\) the model is approximately a simple power law with index \(\alpha_1\) and \(\alpha_2\) respectively. The two power laws are smoothly joined at values \(x_1 < x < x_2\), hence the \(\Delta\) parameter sets the “smoothness” of the slope change. The delta parameter is bounded to values greater than 1e-3 (corresponding to \(x_2 / x_1 \gtrsim 1.002\)) to avoid overflow errors. 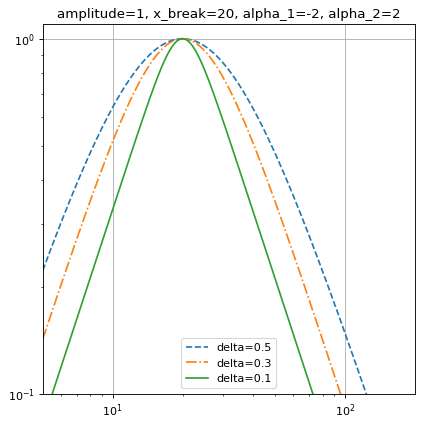 The amplitude parameter is bounded to positive values since this model is typically used to represent positive quantities. This property is used to indicate what units or sets of units the evaluate method expects, and returns a dictionary mapping inputs to units (or None if any units are accepted). Model sub-classes can also use function annotations in evaluate to indicate valid input units, in which case this property should not be overridden since it will return the input units based on the annotations.